The Samsung ML-2510 monochrome laser printer is designed to handle any small business situation. Slight improvements over earlier models include increased print speed and resolution, more memory and a wider range of capabilities. An optional Ethernet controller expands this printer's capabilities to that of an office resource that can be shared across any size network, whether it be in a home office, small business or larger office. Advertised features and conveniences are combined with low consumable costs and durability. Three model variations allow for customizable interfaces and RAM options. 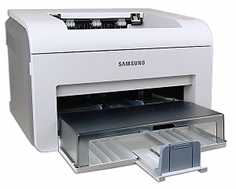 The Samsung ML-2510 prints at speeds up to 25 pages per minute, considered reasonably fast for printers in this class. Depending on the specific model variation purchased, effective output print resolutions up to 1,200 x 1,200 dots per inch can be achieved, yielding crisp, sharp text document reproduction. The ML-2510 comes with a maximum page RAM of 8 MB, which is sufficient for output that contains business quality text or professional looking monochrome graphics. Other model variations offer printer RAM up to 32 MB, which can more easily accommodate the demands of network sharing between multiple computers. All model variations have a recommended duty cycle of 10,000 pages per month, allowing for reasonably sized print jobs while ensuring long life and reliability. Standard installed interfaces included in the ML-2510 and ML-2570 are a high speed USB 2.0 connection and bi-directional parallel, with an optional external 10/100Base-TX Ethernet adapter. The ML-2571N offers USB, parallel and Ethernet connections as internal, built-in interfaces. A 250 sheet multipurpose tray comes standard with all three variations, as well as an output capacity of 100 sheets. A broad number of media sizes are supported, ranging from 3 x 5 in. card stock to 8.5 x 14 in. legal paper. This printer can also accommodate a variety of media types such as plain paper, envelopes, labels, card stock and transparencies. Allowable media weights range from 16 to 43 pounds. Supported operating systems include Windows XP (32 and 64 bit), Windows 2003 Server, Mac OS X and various builds of Linux. All variations have a dimensional footprint of 14.1” wide by 11.8” deep by 9.5” high, and a weight of only 10.6 pounds, making integration into even the smallest of work spaces possible. Noise levels are less than 53 dBA when printing and less than 35 dBA when in standby mode. The 8 MB of maximum allowable RAM installed in the ML-2510 is not enough to handle networking if the optional external Ethernet adapter is purchased. Although the external adapter is compatible with both ML-2510 and ML-2570 variations, it is obvious that the ML-2510 was meant to be connected directly to a PC and not to a network. The Samsung Printer Language emulation in the base model limits capabilities to host-based printing, making the unit dependent solely on the software installed on the directly-connected computer and limiting network functionality. Although maximum print speed is higher than earlier models, paper input and output capacity is lower, as little as one half that other printers in its class, requiring larger volume jobs to be almost constantly attended. The ML-2510 only supports OS 10.3 on Mac systems due to limited printer language capabilities that come with this base model. The ML-2570 and ML-2571N consume 100 Watts more than the ML-2510 while fully operational and 3.5 Watts more while in power save mode. The only differences in features are integrated Ethernet capabilities and increased RAM. The print mechanism is the same, so the extra power consumption is hard to justify and hardly worth the increased energy costs. Although noise levels are advertised as low for models in this class, warm ups can be rather loud and distracting, and can make use in shared spaces bothersome. 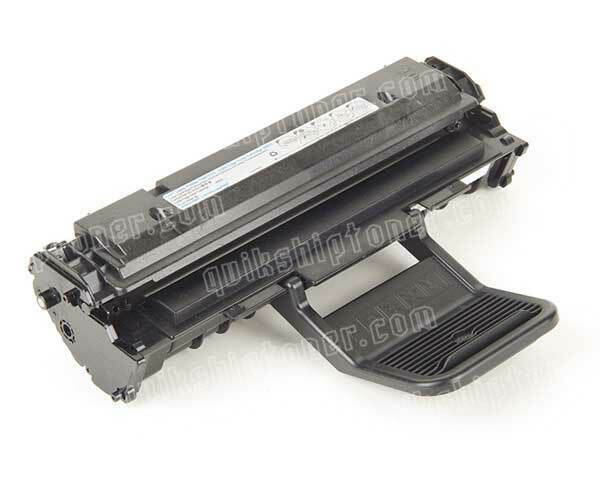 Review it: "Samsung ML-2510 "
The Samsung ML-2510, ML2570 and ML-2571N all ship with a black starter toner cartridge with an average yield capacity of 1,000 pages at 5% coverage. Replacement toner cartridges have an average yield of 3,000 pages at 5% coverage. The cost of toner averages 1 to 2 cents per page. 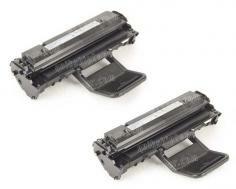 ML-2510 (ML2510) 2Pack of Toner Cartridges - 3,000 Pages Ea.